Huanglong is located in the northwest part of Sichuan Province, China, 50 kilometers north-northwest of the capital Chengdu. This scenic area is studded with colorful pools of limestone formations, snow-clad mountains, diverse forest ecosystems, as well as waterfalls and hot springs. The area also has a population of endangered animals, including the giant panda and the Sichuan golden snub-nosed Monkey. The major scenery in Huanglong is concentrated in the 3.6-kilometer long Huanglong Valley that includes snowy peaks and the easternmost glaciers in China. Due to its layered calcium carbonated deposit patterns, the valley resembles a golden dragon winding its way through the virgin forest and stone mountains. Along the valley are scattering numerous colorful ponds of different sizes and shapes, which are strewn with gold colored limestone deposit that shimmer in the sunlight. In fact, the name “Huanglong Valley” which means “Yellow Dragon Valley” in native tongue, comes from this illusion. Thousands of years of geological evolution has sculpted Huanglong into numerous unique landscapes and geological landforms that you see here today. Glacial revolution, terrane structure, stratum of carbonic acid rock, tufa water and climatic conditions such as Arctic-alpine sun light have created this popular travertine landscape. One of the greatest geologically interest is the extensive calcite deposition that has taken place. Algae and bacteria proliferate in a number of these pools, giving a wide range of colors from orange and yellow to green and blue. Other karst features include long limestone shoals, notably Liujinshan (Glazed Golden Fan) and Jinshatan (Golden Sand Beach), in Huanglonggou. These are extensive slopes of active limestone deposition, covered entirely by a thin layer of flowing water. 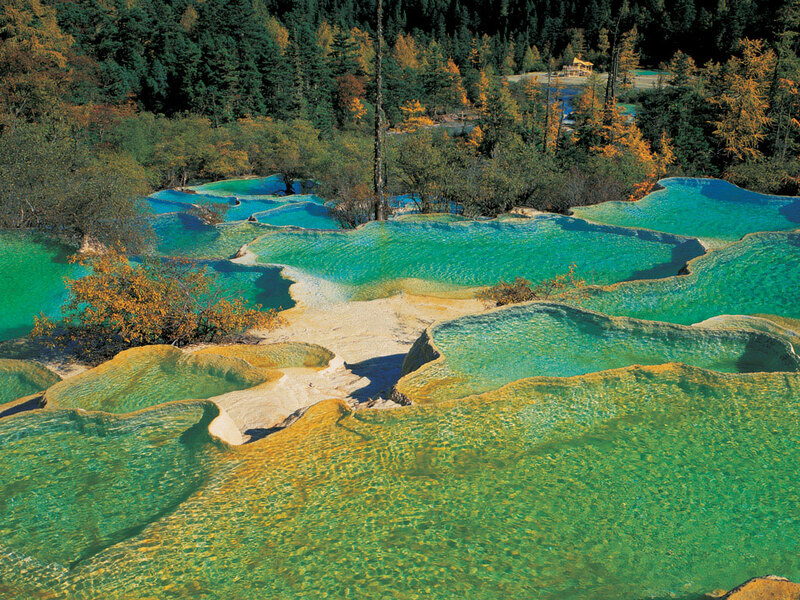 Huanglong has been noted since ancient times. A pair of small stone pagodas is found in the Yuya ponds at the head of Huanglong Valley. The Songpan County Chronicles recorded that Huanglong's three temples, one behind the other, were built in the Ming Dynasty (1368-1644), and attracted a large number of worshipers. Much of the landscape of Huanglong, notably around Huanglonggou, is important in local Tibetan religion, culture and folklore. There are many legends associated with various natural features in the area. 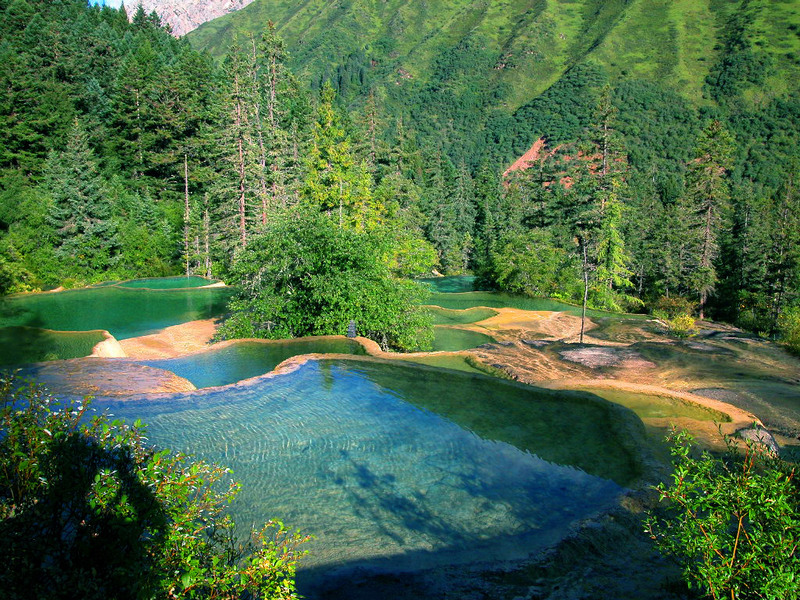 Because of its spectacular diverse forest eco-system, Huanglong Nature Reserve was enrolled as a world natural heritage site by UNESCO in 1992.